Fontana, Calif.- A new study by RENTCafe names Fontana as the Most Prosperous City in California and the Fourth Most Prosperous City in the U.S. out of cities with a population over 100,000. 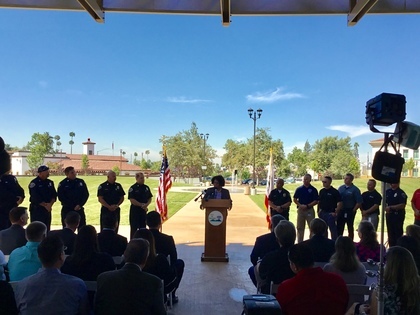 A press conference was held the morning of June 14, 2018 to celebrate residents and businesses for their contributions in making Fontana the thriving, financially strong and prosperous city it is today. The RENTCafe study focuses on six key economic and demographic factors: change in population, median income, home values, inhabitants with a higher education degree, poverty rate and unemployment rate. According to RENTCafe, the list of top cities is based upon how much progress a given city has made between the years 2000 to 2016. Fontana excels in the categories of population and home values with an increase of 60%, along with a higher education change of 57%. "It's beyond dispute that the city has come a long way since the turn of the century, not to mention since its foundation. From a small agricultural town, Fontana has turned into what's now one of the most important regional hubs for the U.S. trucking industry" states Balazs Szekely, author of the RENTCafe article, "The Most Prosperous Cities in the U.S."
During the press conference at the newly constructed Miller Park Amphitheater, Mayor Acquanetta Warren spoke alongside Fontana Unified School Board President Peter Garcia, Fontana Chamber of Commerce President Phil Cothran and Senior Vice President and Area Manager of Kaiser Fontana Greg Christian. "This [recognition] is significant if you know how far we've come...We have overcome challenges and have emerged from them a stronger, more prosperous city," says Mayor Warren. "Our future looks bright in Fontana." Looking ahead in 2018, construction on the Central Park Sports Complex is expected to begin, approximately 3,000 new homes are to be built and the City of Fontana plans to continue welcoming big name retailers like Sprouts and Oggi's. View the top 20 Most Prosperous Cities in the U.S. here. For more information about the press conference or the Most Prosperous City in California recognition, please contact Martha Guzman-Hurtado at (909) 350-6520 or by email.